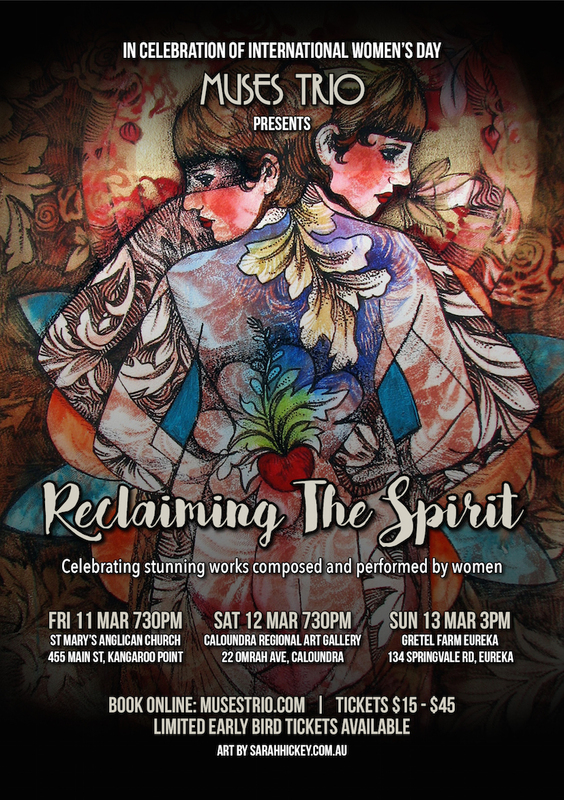 Feature concert: Reclaiming the Spirit, for International Women’s Day. Fri Mar 11, St Mary’s Anglican Church, Brisbane. After completing bachelor degrees in fine arts and education, and then five years of teaching art in Queensland high schools, Sarah Hickey started to produce art professionally after a long hiatus from her own creative practice. Hickey has held nine solo shows and participated in twenty-five group shows. A finalist in the Redland Art Award, Xstrata Percival Portrait Award, Clayton Utz Art Award, Marie Ellis OAM Drawing Prize, The Mandorla Art Award, Kenilworth Painting Prize, Lethbridge 10000 Art Award and $20, 000 Metro Pearls Competition; her work was featured in Curvy magazine. Read more at www.sarahhickey.com.au. In addition to the online shop on the website, Sarah sells embellished limited edition screen prints. Only 25 prints of each image are made, which are then individually coloured. Check out her Facebook Art page, comment “SOLD” to buy your own little piece of Sarah Hickey’s work.